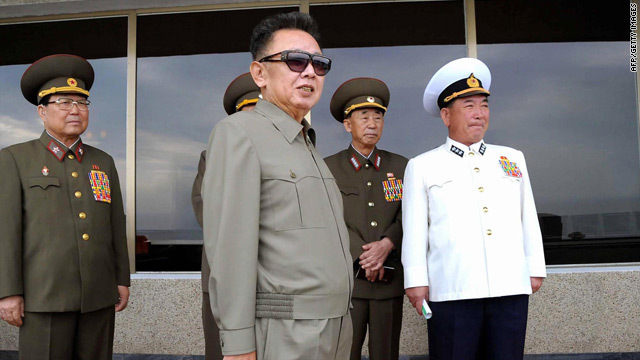 An undated photo of North Korean leader Kim Jong Il inspecting the Korean People's Army, released September 13. (CNN) -- North Korea stated its commitment to lasting peace and a nuclear-free Korean peninsula in an editorial published on New Year's Day, state-run media reported. "The Workers' Party of Korea and the government ... will strive to develop relations of good-neighborliness and friendship with other countries and achieve global independence under the unfurled banner of independence, peace and friendship," KCNA reported. The editorial may be a hopeful sign as the international community tries to coax Pyongyang back to six-party negotiations aimed at ending its nuclear program. North Korea has refused to return to the talks conducted by the United States, Russia, China, South Korea and Japan, insisting that it wants to talk directly with the U.S. government. In April, Pyongyang declared the talks "dead" in anger over international criticism of its nuclear and missile tests last year. U.S. Secretary of State Hillary Clinton previously said the United States was willing to meet bilaterally with North Korea but only within the framework of the six-party talks. She also has warned that the United States will not normalize ties with Pyongyang or lift sanctions unless North Korea takes irreversible steps toward dismantling its nuclear program. "The fundamental task for ensuring peace and stability on the Korean Peninsula and in the rest of Asia is to put an end to the hostile relationship between (North Korea) and the U.S.A.," Friday's editorial said. "It is the consistent stand of (North Korea) to establish a lasting peace system on the Korean Peninsula and make it nuclear-free through dialogue and negotiations." Some analysts have said that North Korea might be trying to buy time with its new outreach to the United States. Recent reports in Seoul, South Korea, have claimed North Korea is in the final stages of restoring its Yongbyon nuclear plant, which Pyongyang had begun to disable before walking away from the six-party talks. Given the secrecy of the North, those reports could not be verified. Analysts said North Korea is also desperate to break out of its diplomatic isolation and ease its economic pain, especially after the U.N. Security Council imposed tougher sanctions on the country in response to Pyongyang's nuclear and missile tests during 2009.